Brought all the necessary ingredients on Saturday and thought I get up early on Sunday to make a French Toast Breakfast. 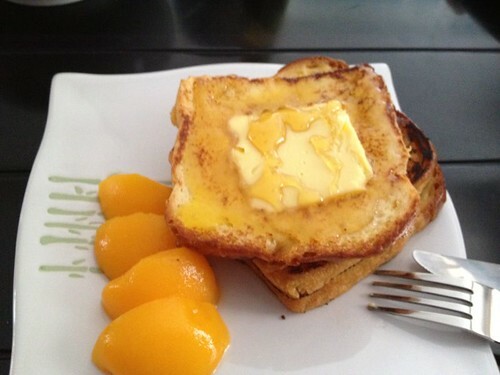 I think I need to tweak my batter mix as the French toast turned out a tad soft with a hint of soggy. So I left the toasts in the frying pan a little longer to "dry up" the bread which led me to the next problem. Yes, I got rid of the "soft" problem but the bread is a bit more charred now. I don't think it was a case of burnt toast but more likely due to the caramelisation of the sugar in my batter mix. In any case, it points deduction in the visual presentation section. Still, the breakfast turned out yummy but I thought it would be better had I have more eggs in the batter to settle the "soft" problem. Right now it's a ratio of 4 eggs to 1 cup of milk. I made 9 pieces of toasts for myself and my housemate with plenty of batter unused to the extend of being wasteful. Next time perhaps, I'd try 3 eggs to 1/2 cup of milk for 2 to 3 persons. p.s. It was disappointing not to be able to find maple syrup in Taobaoland. I used Australian honey as an alternative. It was a case of no fish, prawn also good. I'm sure it tasted awesome, hehe:) is the square in the middle cheese? Nope. That is a slab of awesome butter.